Nominations are now being accepted in four categories that recognize the profound impact that philanthropy has on the Chattanooga community. Nominations are due June 14, 2019, so please submit the individuals and companies that help your nonprofit succeed today. To sponsor or for more information, please contact Brianne Lalor at 423-400-0082 or blalor@nnhouse.org. Registration for the 2019 luncheon will open soon. National Philanthropy Day® is the official day set aside to recognize and pay tribute to the great contributions that philanthropy—and those people active in the philanthropic community have made to our lives, our communities, and our world. 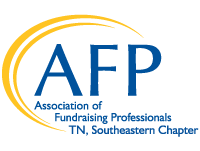 National Philanthropy Day is formally supported by the Association of Fundraising Professionals (AFP) and hundreds of other non-profit and for-profit organizations throughout North America.